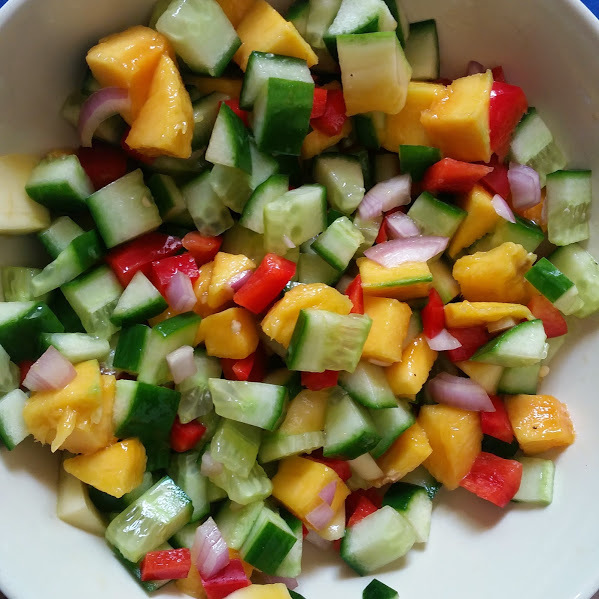 This post is all about 2 of favourite salads: raita, a yoghurt based salad, as well as mango salsa, a tangy, crunchy salad, that’s perfect for satisfying those food cravings! These salads are also one the easiest to make and can be ready in minutes! Here, in Sri Lanka, as is common is other parts of the subcontinent (Bangladesh, Pakistan and India), biryani is a customary meal, especially during special occasions such as Eid. Biryani to me represents a rich, sumptuous dish, mostly with a meat of your choice: chicken, beef, lamb, mutton. Biryani could even be vegetarian or pescetarian (fish/ seafood), and always accompanied by a raita, which is a salad in a yoghurt dressing. Raita is a perfect accompaniment for biryani. The cool raita is the perfect ying to the yang; the spicy, rich biryani. It’s one of the easiest salads to make, and by no means should it be simply relegated to being a side-dish to biryani. It’s perfect for those hot, summer days, offering a refreshing dish for a meal; either as a main or side-dish. Cucumber is one of the star ingredients in this salad, and the water content of this vegetable provides the much needed hydration for our body! 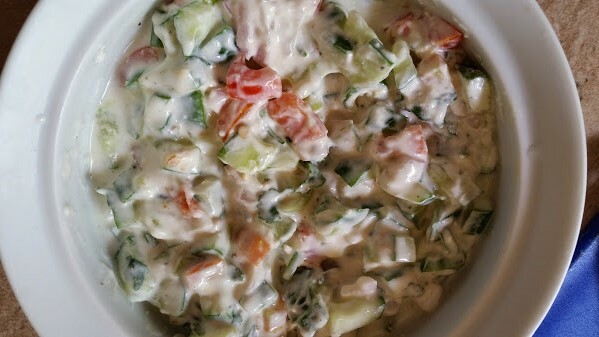 There are many different ways of making raita, but I’ve found that this recipe, handed down from my mother, is perfect! Yup, it’s as easy as that! You may add in the chopped coriander and mint leaves just before serving, especially if you’re making the raita ahead! If you’re making it ahead, remember to keep it in the refrigerator, else the yoghurt starts to break down and you might end up with a soppy mess. Adding the chopped herbs towards the end allows them to remain crunchy and fresh, rather than wilting within the yognurt dressing prior to serving. Combine all the ingredients (except for the lime/ lemon juice) in a bowl. Add in the juice just before serving. This salad has become of my favourite to-go salads. It’s tangy, juicy and crunchy all in one bowl of yummy goodness. It’s perfect for adding onto a taco as well!